Hungry stomachs and helping hands are set to descend upon Country Kitchen Thursday in order to support those in need. The occasion is called Dining For Dollars. It's a fundraiser put on by Survival House in cooperation with Country Kitchen. Survival House, founded in 1982, is a Johnson County based outreach program dedicated to helping the survivors of domestic abuse and sexual violence. The work they do goes beyond providing services for clients, though that's the organization's main focus. Survival House often works with the University of Central Missouri, providing information and allowing for student involvement. Fundraisers are another part of Survival House's involvement with the community. Bradley Schulte, coordinator at Survival House, stressed the economic importance and necessity of fundraisers. “About 68 percent of our budget is covered by Federal and state grants, and those grants only cover direct services, as in funding our shelter, staffing, etc.,” Schulte said. The money collected from fundraisers goes directly into helping Survival House's clients. 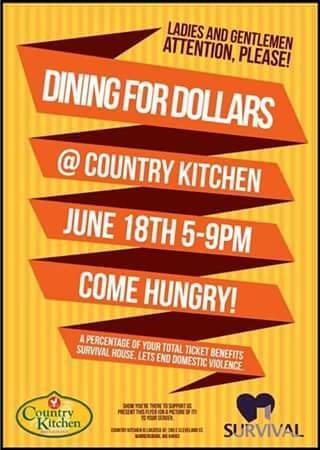 Dinning for Dollars will mark the first time Survival House has worked with Country Kitchen. At the event, customers are to present the event's flier, in either paper form or digital form, when paying for their meal and a portion of the total will go to Survival House. Survival House has put on fundraisers with a diverse array of local businesses, including bars, such as the Bay and Stonehouse East Pine Pub. Schulte admits the bar scene might not be for everyone. “Sometimes we do have fundraisers at establishments that sell alcohol, and that's not always for everybody, and that's not always considered a family environment for a lot of people,” Schulte said. Schulte said he believes that an event like Dining for Dollars expands the horizons for more people to participate. Elaine Sepulveda, executive director, of Survival House, said the most important thing about the fundraiser is that it helps the clients. Country Kitchen is located at 205. E Cleveland St., in Warrensuburg, Mo. Follow Survival House of Facebook here.